So...after spending a few hours looking at my last mani and being unhappy with the pairing of Glitter Goblin over Bizarre Blurple I decided it had to go. I was just going to do a plain color, no art, because I still had costumes to finish for my kiddos. But then I ran into this post from Let Them Have Polish and knew I had to be a super huge copy cat. I used to play roller derby and have fond memories of wearing lots of stripy socks and tights. I used 3 shades from Sinful Colors for the base on alternating nails: Cloud 9 (orange, right hand), Dream On (neon purple, left hand) and Irish Green (both hands). 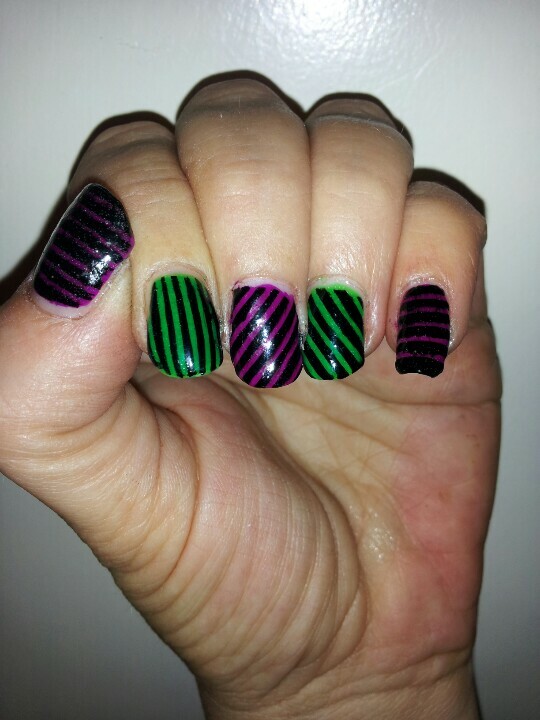 Then I got down with the striping tape and the Wet 'N Wild Shine Black Creme. 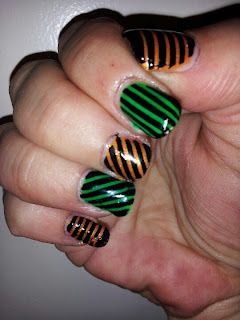 Here are my stripes! They're not as good as the inspiration but they'll do. Yes, there is a huge ding on my pinky on my right hand - it was a casualty of last minute costume finishing.